He is a master sculptor of music and lyrics which are notable for their imagery, grace, lucidity and aptness of phrase. He is a non-conformist in a industry dominated by the predictable. He is an intelligent virtuoso boiling over with fresh ideas, explosive music and biting commentary. He is blending old and new schools of theater and rock and then taking it one step further. 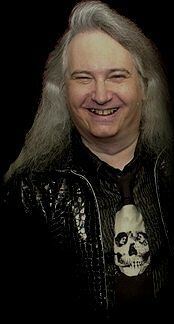 He is Jim Steinman. In a word, Jim Steinman is versatile. During his illustrious career Jim has worn many hats - writer, arranger, producer, and solo-artist. But, regardless of the project, it has always been Steinman's appetite for and appreciation of the extreme that has set him apart from his contemporaries. Inspired primarily by the styles of Wagner and Spector, Jim Steinman the innovator proves over and over that he is far more than the sum of his influences. Artisan of the "Epic Rock" style and father of the "Power Ballad," Jim Steinman is standing at the threshold of yet another artistic frontier. As his career comes full circle, theater and film, (his starting point some two decades ago), come back into view. It is fully expected by those aware of his vision and skill that he'll be the one who brings theatrics both on stage and screen to new musical heights. And who better to do so than he? Discovered in 1971 by the famed Broadway producer/director, Joseph Papp, Steinman worked briefly in theater where the visual and auditory are equally emphasized. Amid the ultra-conservative theater sect, Steinman's work was viewed as too daring, sexually explicit and violent. It was this attitude that eventually brought him to the music industry. On record and in concert arenas, Steinman was free to bring his rich, vivid, often chillingly explicit ideas to life. During the years spanning 1977-1982, Steinman wrote and produced three complete albums (two for Meat Loaf, one for himself) and scored the movie A Small Circle Of Friends. His trademark style was employed on a veritable 'grab bag' of artists with astounding success in the years that followed. These artists include, Bonnie Tyler, Air Supply, Barbra Streisand, Barry Manilow, The Sisters Of Mercy, Take That and Celine Dion. Steinman also worked on various soundtrack LP's such as Streets Of Fire, Footloose, and The Shadow. In recent years it has been Steinman's work with Pandora's Box (his own all-girl band) on Original Sin, and with Meat Loaf on Bat Out Of Hell II - Back Into Hell, that has re-focused his sights back to stage and film. Supremely theatrical in their approach, they seemed to have rekindled Steinman's desire to unite the ocular and the auditory. Given the less conventional attitudes of audiences today, the results should prove to be amazing.